Poor William. My dear friend, my unforgotten brother. He had always had a tendency to immerse himself too deeply in his research. He always had a tendency to immerse himself in his own head. At first the long breaks in our correspondence and the subtle, yet disturbing changes in writing style, did not alarm me. Because more than once during our long friendship we had gone through phases where he either had not returned my messages. We had been friends since high school in Crystal Lake, Illinois, where we grew up together. In those days he was sociable. He was by no means an extrovert then, but he was more prone to casual conversation than when I knew him later in grad school. We were close, often inseparable. Driving in his car, we discovered together the music that shaped us - the gothic alternative bands of the eighties - The Cure, Siouxsie, Bauhaus, Joy Division. We lamented our shared fears and insecurities. We debated the merits of Camus and Sartre and Simone De Beauvoir. We were both prone to dramatic, brooding silences and commiseration over our self-enforced isolation. We were both romantics at heart. I was probably the more poetic. But William was smarter. He was more intellectual, more proficient in navigating the difficult and logical abstract corridors of philosophy and history. After high school we parted while we pursued our undergrad degrees at colleges in distant parts of the Midwest. Later, I sometimes think miraculously, we both ended up doing graduate work at the University of Delaware - I in literature, and he in ancient languages. At Delaware, we quickly rekindled our friendship. We once again listened to music together, wandering the campus in the moonlight, conversing of Bauhaus and Nietzsche. But even in those days, though we tried to meet regularly, I sometimes wouldn’t hear from him for a month. And after I moved to Washington, D.C., for my brief gig at the Smithsonian American Art Museum, we spent months without exchanging a word. Looking back, I blame myself. After being briefly reunited with William, I allowed us to stray apart. Perhaps, if only I had been more persistent . . . Before he even finished his graduate work, William secured a tenure-track job in the Department of Ancient Languages at Salem University based on the promise of his controversial research decoding the material cultures of pre-Roman Celtic burial rites. It was then that he moved into the strange, seven-gabled house in Barrow, Massachusetts. As for me, my mentors considered me an excellent job candidate for a professorship. I successfully published my own important research on American literature, in particular on Nathaniel Hawthorne, in competitive journals. Yet I floundered professionally for a time as I taught at various mid-Atlantic universities. When I moved from the east coast to Phoenix, I believed that William and I had lost touch permanently. He stopped responding to me. My text messages to him started back at me on my phone screen unanswered. I e-mailed him on several occasions, but those, too, were never returned. I even once wrote him at the Barrow house but was never even sure if he still lived at that address. I should have made more of an effort, though. I could have called. I could have tracked him down at Salem State University. But I was struggling through my own difficulties. My wife was hospitalized. She nearly died before undergoing a strenuous physical and mental rehabilitation. And I was working desperately to preserve my too-fragile academic career. It was a difficult time. Then, in June, I received without warning his single, feverish letter. 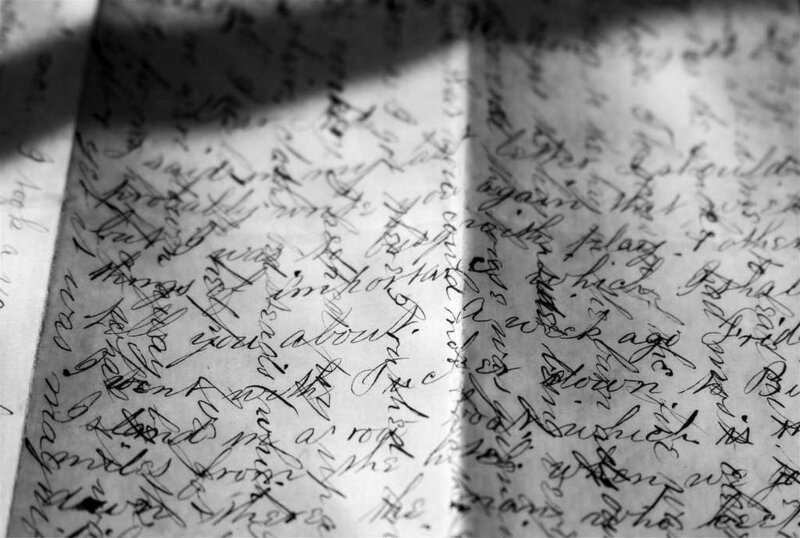 He had written it, cross-hatched in the olden style, in cursive handwriting. It was very strange. If you are interested, maybe one day I will show it to you. But for now, I will just summarize it. Cross-hatched letter, approximate facsimile of William Cullen's to me. via Liz West. William apologized for not being in touch. He regretted not keeping his closest friend abreast of his studies. He assured me that he was in the best health and happiest days of his life. He said that while the others in the field of ancient language had once doubted him, he had advanced his doctoral work well beyond the comprehension of his colleagues. Beyond even his own wildest expectations. He was on the edge of something even bigger, he explained. He had uncovered an ancient written language shared exclusively among high priestesses of the druids. His discoveries not only changed the scholarly understanding of Celtic religion, he said, but once made known, would shatter our very understanding of the universe. But he was also a little nervous. He said that even though he "had harnessed great forces," there was a small chance that things might “spiral out beyond the boundaries of (his) mastery,” as he put it. That is why he was reaching out now. He warned me that he required complete solitude for the next thirty days when he would be focusing exclusively on his research. But if I didn’t hear from him at the end of this period, he begged me, I must to come to Barrow and find him. “Find me,” he implored. “Enter this tenebrous, seven-gabled house and find me.” He told me where he would leave a key to the front door. This was very strange, of course. Even for William. But what could I do? What would anyone do? I waited. And I waited. After thirty restive days, I emailed him. I texted him. I called him. But nothing. And after forty days I boarded a plane to Barrow. It was on a frigid, moonlit night, through the twisted, skeletal branches of the ancient elm tree, that I first beheld the hulking house on the hill. Its seven black gables reached toward the stars. From underneath a reptilian rock sculpture with bulging eyes and protruding tongue I retrieved the door key. He wasn’t there. No one was there. The house appeared to be occupied. The heat was on. The lights were on. A cold coffee cup with dark rings of the evaporated liquid sat on his desk. From the top of this desk books and papers overflowed onto the wood-panelled floor. His bed was unmade. The refrigerator contained recently-spoiled meat, and slightly moldy cheese. His clothes were in the closet, his toothbrush in the bathroom cabinet. But no trace of William. And neither the police, nor anyone, had heard from him. At first I only used the Barrow house as a base of operations. I scoured the town and the surrounding area. I talked to the police and filed a missing persons report. I interviewed clerks at nearby grocery stores and gas stations. I sought help among his colleagues at the university. But the longer I stayed in the house, the more I suspected that the clues to William’s disappearance lay within it. I decided to search the place more closely. And finally, I found the concealed door. Behind it, narrow stairs led into a black, musty abyss. There was no light switch. I found a flashlight and crept as quietly as possible down the soft, yielding, creaking stairs, into a crude cellar. The cellar was triangular in shape, small, irregular, only about ten-feet wide at its hypotenuse. The walls were made of roughly-hewn stone and supported massive wooden shelves of old books. The floor was packed earth. Along the longest wall stood a massive, disintegrating table. Upon it stood an enormous stone candelabra, its candles dripping in frozen streams onto the desk. Strange symbols had been carved into the desktop. Heaps of obscure and arcane books, journals, and papers lay scattered across it. Among the half-rotten mass I discovered William’s own journals. That is why I have begun to keep this blog. This web page will constitute my efforts to transcribe William’s journals. I will post William’s writings in part simply to bring them into the world in his honor. Perhaps in posterity his research will make some contribution to general knowledge of ancient rites and druidic languages. But also, maybe someone will find them and help me piece together the clues to his disappearance. For if William is not completely lost, others with more expertise in ancient lore and ritual may be able to help find him. Maybe, just maybe, he is out there somewhere, still alive, waiting for me to find him.